This savoury strawberry recipe is a real summer treat. It’s simply made using Parma ham and Parmesan layers, and makes for a wonderful starter for dinner parties or special occasions. Thinly layer some grated cheese approximately 10cm x 4cm onto a non-stick baking tray or silicone sheet, sprinkle with a little black pepper. Place in the preheated oven for 4–5 minutes until golden. Remove from the oven and using a spatula transfer to a flat surface to cool. Repeat until the cheese is used (should make approx 8 parmesan biscuits). Lay the parma ham onto a baking tray and transfer to a preheated oven for 6 – 8 minutes until nice and crispy. Remove from the oven and set aside to cool. Place the strawberries in a bowl and drizzle with some balsamic reduction. 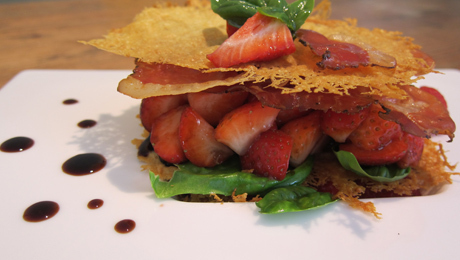 To build the millefeuille, firstly place a parmesan biscuit at the base, then add a few basil leaves, top with some balsamic strawberries, finish by adding a piece of crisp parma ham and top with another parmesan biscuit.